Doesn't the cover of Turf Wars have Mako with his hair formal? But in the actual content his hair is back to its casual look? An oversight? Yeah, it's a little weird. I can get giving him his old hair back (like Runamuck said, you can explain it away as it just being part of being his bodyguard job). But it does seem like an oversight for the cover to have it the old way. I guess that's just a side-effect of getting a different artist to draw the cover so early on? My issue with the art is not so much that the characters look off-model (though I do get the impression that Koh is more comfortable drawing some characters than others), so much as that the artwork seems inconsistent. Some parts look really good, but other parts look rough, especially in the later parts of the preview. That said, I'd say that overall the artwork is still pretty decent. It's not as good as the FCBD Korra story was, but it's a lot better than some other tie-in comics. (The Voltron comics, for example, don't look very good at all.) It might be more of a personal preference thing, to be honest. Has anyone who doesn't like the art made any 'Koh the face stealer' jokes yet? Or has it always just been to on the nose? There are some oddities about some characters hair. Tonraq is missing the gray stripes he had in his hair in book 4 and Mako is also back to his pre book 4 look. 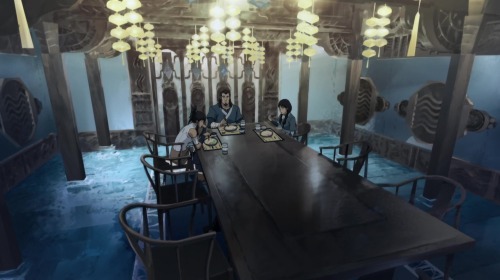 Senna and Tonraq's dining room is completely different (There's an establishing panel showing that it's the same building, they haven't moved house or something.) As they live in a palace, I guess you could argue they have multiple rooms for eating? I'm disappointed that Mike opted to jump into the romance so quickly- I think it would have been better if they'd used the comics to work on the build-up more given that what happened in the show was pretty limited. I don't know whether he plans on sticking around for future Korra trilogies though, so maybe he felt obligated to get the Korrasami stuff out there ASAP so that he'd actually get to write some of it. As I mentioned before, the retconning bugs me, and I'd have preferred it if they had acknowledged that the relationships presentation in the show had its issues, and instead used this comic to show them starting to fall for each other. The stuff Korra and Asami say in the comic about the timeline of their relationship makes it all the more glaring that some episodes missed basic opportunities to highlight their reactions/ responses in relation to each other. (Even simple things like showing a close-up of Asami during certain key scenes would have helped). Some of the early dialogue in the comic actually feels like stuff that should have been used for a segment of the clip show. From the previews, I can tell you whether Mako learns about it in the first comic or if it'll be in a later one: You can actually read that scene in the previews, it happens towards the end. Not to mention that Korra's trying to reach out to the person responsible for his death. If there's any good fuel for Korrasami, it would be that, but I'm betting the source of any early conflict would be cheap sitcom drama. my guess is it's going to get the same treatment as anything else in this series. what broken avatar cycle? what domestic terrorist organisation? what civil war? what apocalyptic giant monster event? what international anarchistic terrorist assassin squad? what imperialist technomaniac? if all these things can just disappear i guess a deceased father is just one more thing. ...OK maybe giant monsters aren't that odd in the avatarverse. i'll give you that one. Not to mention that Korra's trying to reach out to the person responsible for his death. They are when they look that ridiculous and disappointing, respectively. Some of the early dialogue in the comic actually feels like stuff that should have been used for a segment of the clip show. I really dislike Korra and Asami together as a whole because it seems that Mike is already writing it as the extension of the breaking and taming of Korra's character that took place during season's 3 and 4. I don't see the point of Asami commenting on Korra's fear during their initial drive (especially when Korra was so excited) save that Mike is trying to emphasize Korra's vulnerabilities. We can't have that shrew from the first two seasons making an appearance, except that Asami remarking that Korra's excitement was infectious would have been a far better line and actually more in line with the scene that was made in the television series. 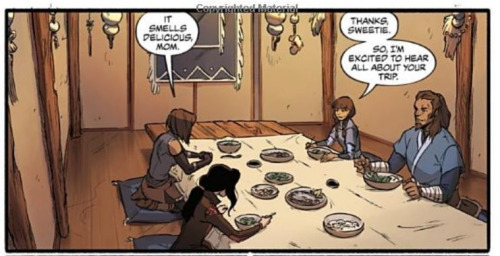 Something about Korra's character in this comic just feels off to me. Maybe my memory is faulty since I haven't seen the TV series since its finale, but Korra in this comic just feels a little...flat and lacking in energy that I was so used to seeing from her. I know she's supposed to be more mellow after her "character development", but even in Book 4 there's still some parts where she's still her snappy and energetic self we see from earlier books. Yeah, there's some parts in the comic where Korra does act like what we see in the TV series (like that shot at Raiko) but her interactions with Asami and whenever their relationship is brought up with others is...meh. In the best way that I can describe it, it feels as if Korra acts way too soft in those moments. There's also a moment later in the comic where Korra acts uncharacteristically nervous and in a context that doesn't seem to make sense at all through the implications of other characters' actions. I mean...I feel like they've had forever to make a quick change to the title cover. It just...looks bad imo. I was talking about Kuvira. Yeah, that's been a problem with most of the series to me. TLoK is suppose to be as realistic as possible given the Sci-Fi and Fantasy element, except Bryke or even just Mike I guess don't seem to care for self restriction or maintaining a fixed set of rules to allow for consistency or coherency. It's why even when I cooled down on the criticism that I just couldn't bother in speculative discussions. Hard to be invested when the writer(s) don't care to keep some consistency. A bit random, but Turf Wars is the number one seller for Dark Horse on Amazon. Part 2 is ranked 6th. Wow, what a depressing list. Usagi Yojimbo and Umbrella Academy are the only non-licensed American comic books on that list. Everything else is licensed properties and manga imports. Man, Dark Horse is just a poor man's IDW these days, isn't it? And the 'breaking and taming' thing- I agree. I don't like that one of the earliest conversations in the comic has Korra apologizing for the vacation going wrong, even though it was Asami's idea to go to the Spirit World in the first place. She already gave her an unnecessary apology in the finale, too. Yeah, she feels very flat in this. Maybe it'll be better with the missing pages (which should at least have her responding to more plotty stuff) but yeah, she's acting very soft. When we saw the positive moments of her romance with Mako, she seemed a lot more... energetic? So I don't think it's impossible to write her as being invested in a romance without making her the way she is in the comic. In this she's very nervous, and blushy, and fiddles with her hair a lot. Turf Wars, Part 1 is out. Please do NOT post spoilers in this speculation thread. If you wish to discuss about the comic after reading it, please do so in this thread. 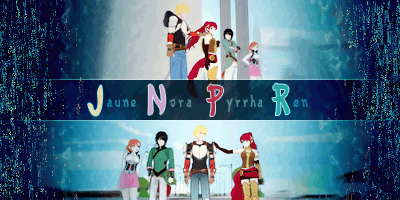 If you wish to speculate on what happens next, you can do so in the Turf Wars, Parts 2 & 3 speculation thread. So… has anyone seen the Avatar panel from the SDCC yet? So… where can we talk about the reviews of the comics that are starting to pop up? Most of the reviews I have seen are rather broad and lacking in detail...and most of them are just focusing on Korrasami, while saying, "Oh yeah, the plot is okay". Huh…? Apparently Nicelodeon can actually be arsed to advertise something related to Avatar or The Legend of Korra all of the sudden. Although it doesn’t really contain anything particularly new, it’s just a slightly animated version of the preview pages we got months ago. Some development pictures for some of the new characters.